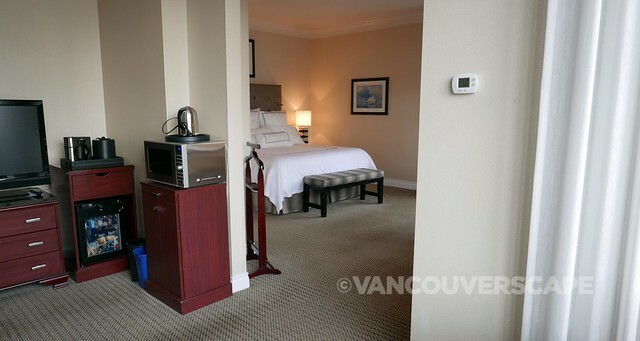 Living in Vancouver, it’s often easy to overlook the numerous lodging options around the city. 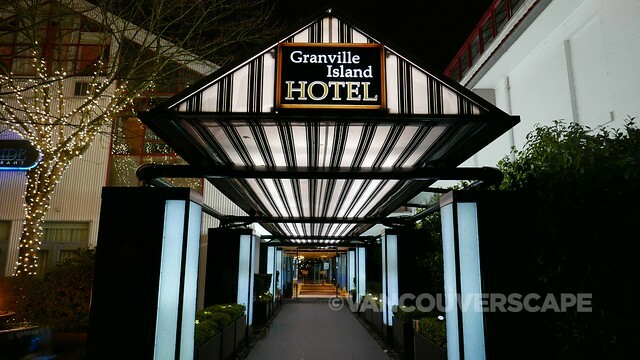 Case in point, the Granville Island Hotel, a lovely 82-room boutique property commanding a waterfront location at the northeast tip of Granville Island. 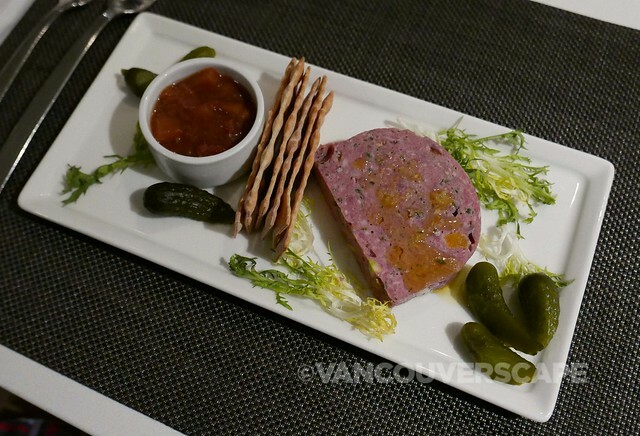 We recently spent a night here to enjoy the views and partake in Vancouver Dine Out Festival at Dockside Restaurant, located within the hotel. 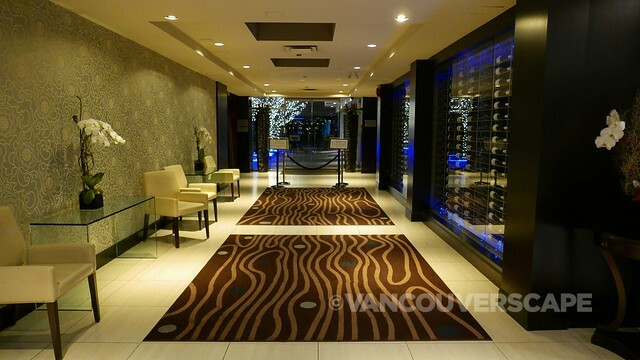 Pass through the black and cream pinstriped awning and along the column of lights and greenery through the glass doors, where the property splits between a cozy lounge, full-service restaurant and check-in desk. 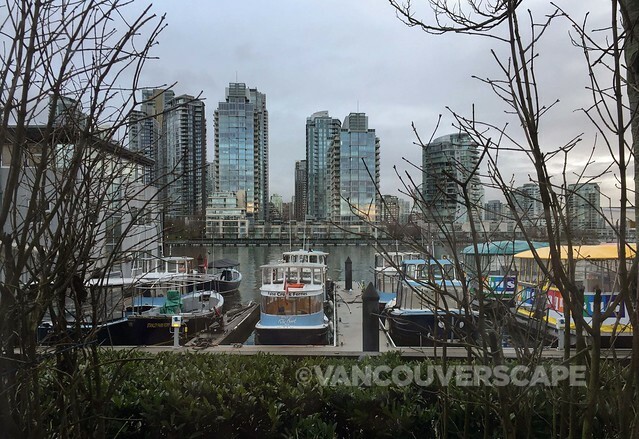 Most of the spaces enjoy False Creek and city views from Burrard Bridge to Science World. 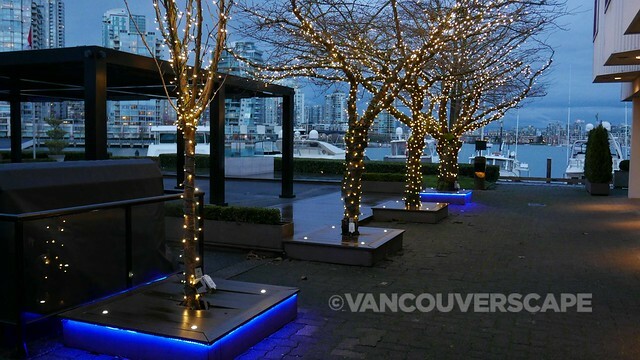 This is a great spot to unwind, leave the car in the nearby parking lot, and explore. 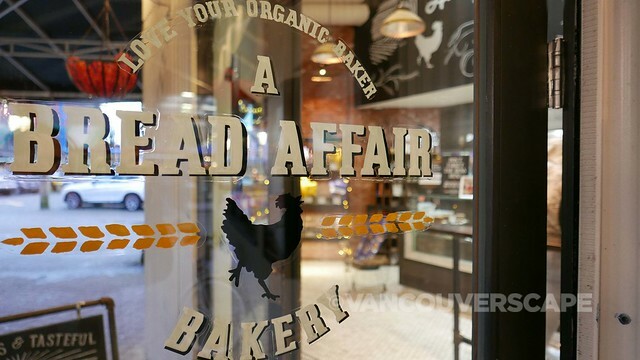 Once you’re through checking out the local artisan shops, galleries, cafes, Public Market and Net Loft, enjoy a modern room with dark wood furnishings and lots of natural light. 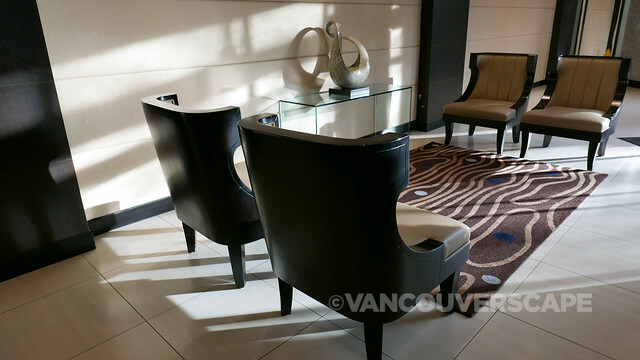 Our Executive Waterfront suite has a queen-size pull-out bed in the living space, two flatscreen LG TVs, free high-speed wifi and a LOT of tech-friendly outlets at the working desk. On the bedside table’s a very handy CubieBlue offering Bluetooth, LED clock, USB and three-prong outlets (I wish BrandStand made these available to the public). 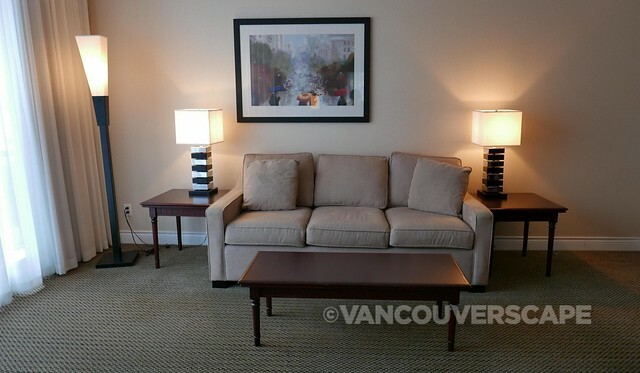 In the spacious living room is a stocked mini bar fridge, coffee maker and Starbucks coffee packets for loading into a CV1 machine. You’ll also find tea and an electric water kettle there. 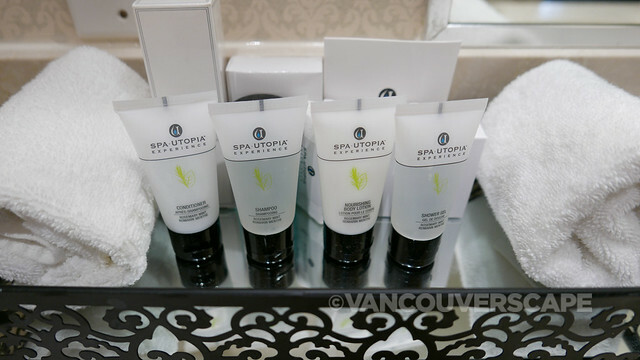 The bathroom contains Spa Utopia Experience amenities. We have a full tub/shower with rain head. The best feature in there is a light dimmer switch. I can’t recall how many hotel rooms we’ve stayed in where the lights are either on or off. In the evening, it helps to have low lighting to get you ready for sleep! Inside the closet is a safe, ironing board and iron, bathrobes, slippers and hairdryer. 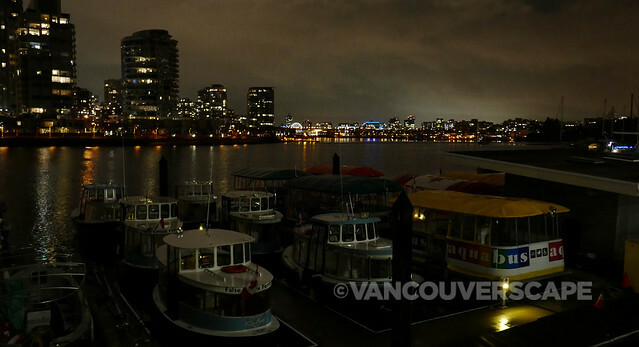 Watching the False Creek Ferries and Aquabus boats pass by from the room’s floor-to-ceiling windows was the best way to chill after a busy week. 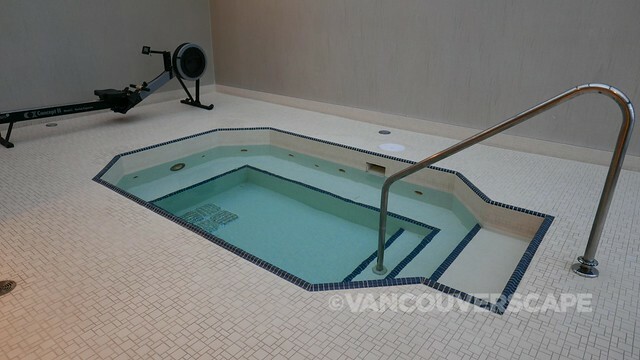 That, and the whirlpool and dry sauna on the third floor made our afternoon complete. 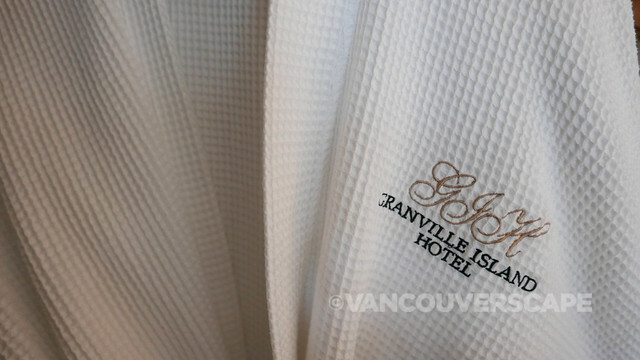 With the Granville Island Hotel’s plush mattress and feather pillows on a king-sized bed, we slept soundly. 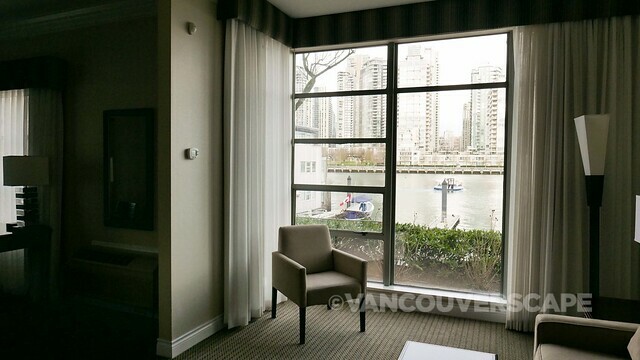 Windows open a bit to allow fresh air in, a plus in any hotel room. We awoke to a cool, sunny morning ready to enjoy breakfast at Dockside Restaurant, with a beautiful view once again. It gets quiet here at night, which given how busy the island gets during the day, is a blessing. Look no further than Dockside for a full range of breakfast options. 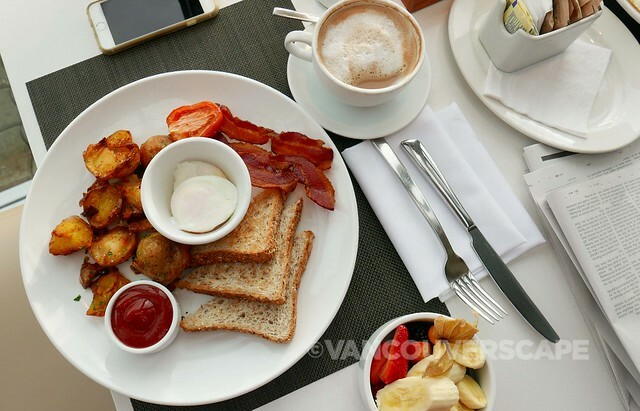 The menu’s filled with light and healthy dishes, Dockside’s own artisan homemade pastries, frittatas, bennys plus the Granville Island Breakfast, shown here with poached eggs and multigrain toast. It’s a quiet Monday morning as we pick up the day’s complimentary Globe and Mail in a rare moment to just enjoy good food and life passing by on the docks. 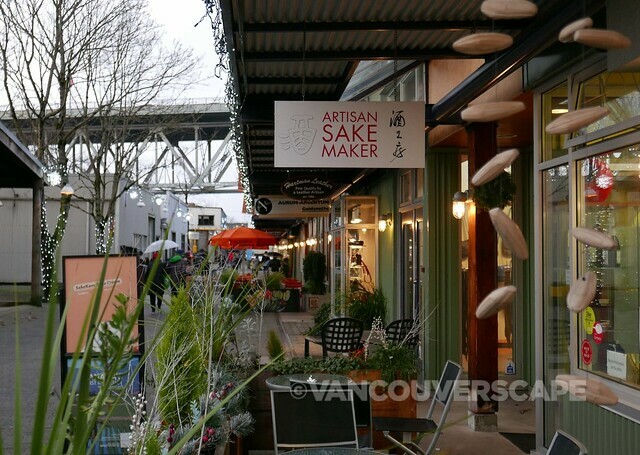 This hotel is perfect for anything you’d want to explore on the Island, from theater, shopping and pubs to Granville Island Public Market, all just a few minutes away on foot. Parking is in front of the hotel (for registered hotel guests; $15.12 per day including taxes). A small gym with a few fitness machines and free weights is on the third floor. 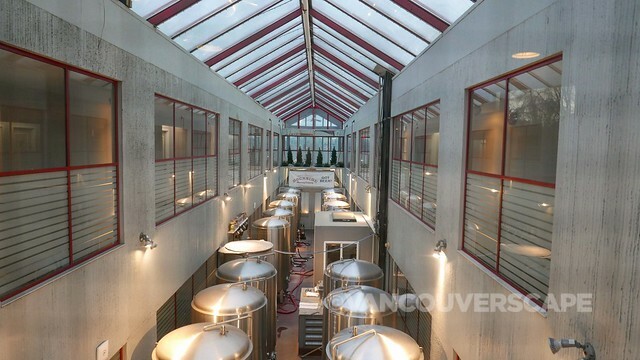 As you walk by the entrance to the gym (also where the sauna, whirlpool and shower are located), notice the row of steel brewing tanks below: Dockside brews its own beer. In season, the hotel rents bikes (with locks and helmets) to guests per hour or by the day. About a 10-minute walk and you’ll find SUP, Seadoo and kayak rental shops too. 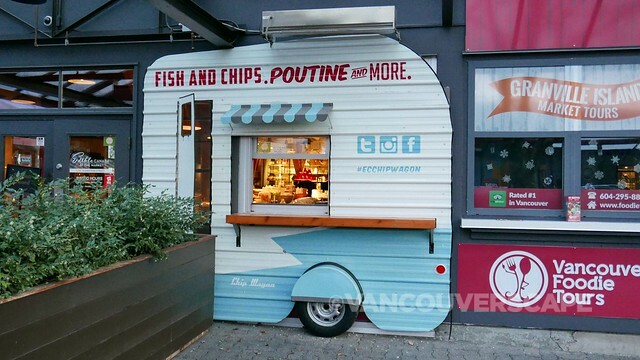 If you’re looking for a workout, simply head next door to the False Creek Community Centre. 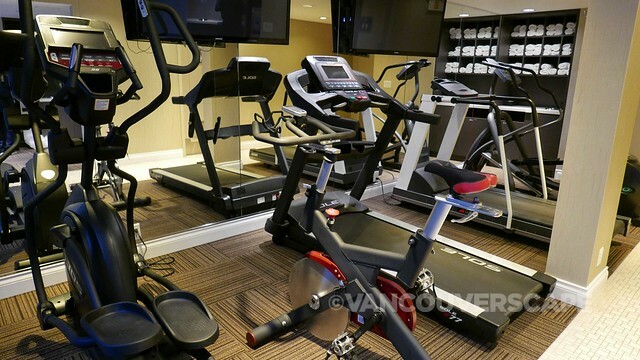 As a hotel guest, you can use their facilities or take an aerobic class for a small fee. 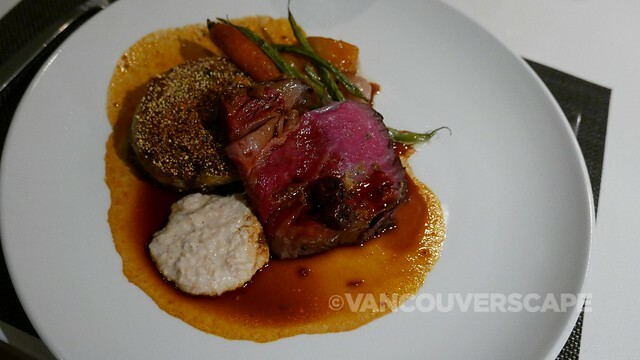 Dockside Restaurant and Brewing Company’s offering a three-course menu (with optional wine pairings) for $40. 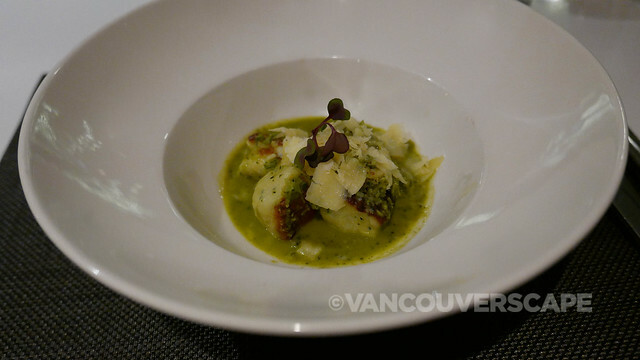 Start with either herb gnocchi with fresh Tofino shrimp meat and broccoli rabe pistou (similar to pesto) or enjoy a homemade, lean boar pate infused with herbs and pistachio. Vegetarians can order a warm winter kale salad with roasted root veggies and manchego. 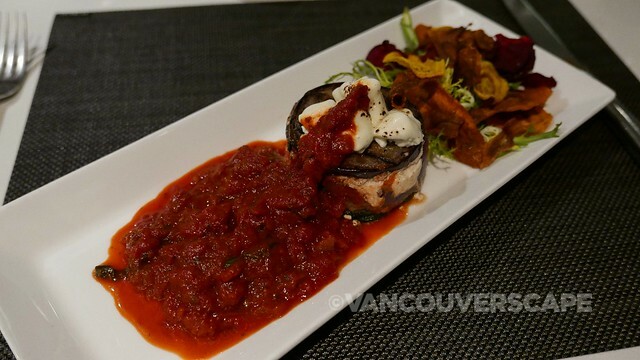 The entree choices include Gorgonzola Pachetti with bechamel and green peas, Two Rivers roasted prime rib with barley rosti and veggies, or grilled vegetable terrine and tomato basil compote, served with spiced root veggie chips. 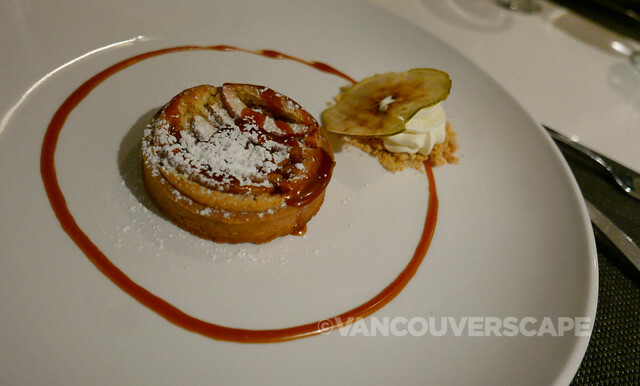 Top off your meal with either tiramisu or apple frangipane. 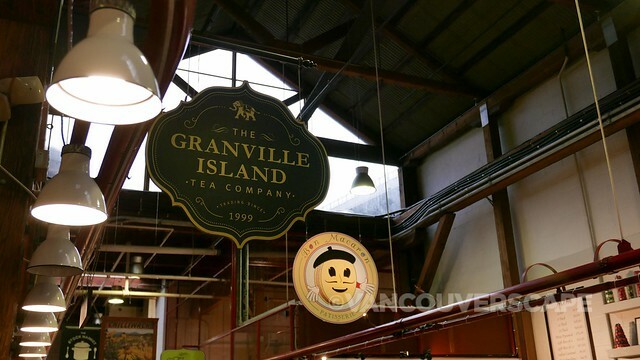 Find Granville Island Hotel at 1253 Johnston Street on Granville Island in Vancouver. 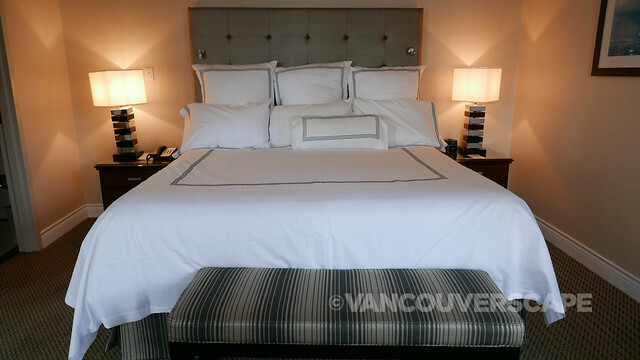 Rooms include Classic, Classic Balcony, Superior, Waterfront Executive, Boardwalk Suite and Penthouse in all price ranges depending on the season. 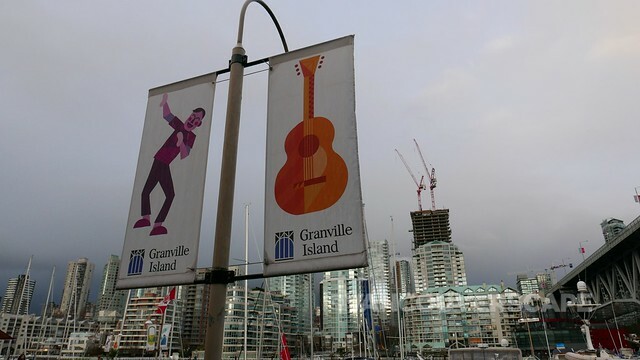 We were guests of Granville Island Hotel and Dockside Restaurant and Brewing Company. Opinions, as always, remain our own.